British tennis star Heather Watson has hit out at online trolls after she received death threats via Twitter. The 23 year old has branded such people as "cowards" and has insisted that they will not force her to change her online posting habits. 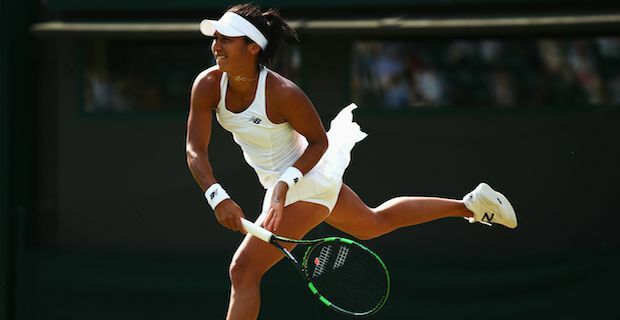 Watson beat Daniela Hantuchova 6-4 6-2 in the 2nd round to reach Wimbledon's third round for the second time where she will take on top seed Serena Williams. The American is a 5 time Wimbledon champion and in great form coming off the back of a French Open win which was her 20th Career Grand Slam. She is very excited about the prospect of facing Williams saying "I've never played Serena before, so I'd love to play her. But she's obviously a very, very tough opponent." When asked about the death threats ahead of the 3rd round clash she said "I think those people, they've got no life. They're just kind of cowards thinking they can say whatever they want on the internet." Watson added "They don't understand that we're just people at the end of the day." She also revealed that she does not pay attention to death threats anymore saying "I don't really check for them anymore really, it's become such a usual occurrence that it doesn't really mean much to me." But fans of Watson's activity need not fret, she has made it clear that she is not going to change her posting habits saying "I really enjoy posting, it's usually always positive when I win. It's just when I don't win. My favourite's posting pictures. I think some people get sick of me posting pictures. But I like it so I'm going to keep doing it."